December can be a busy month thanks to the winter holidays, luckily the gardening isn’t too demanding during this time. Still, there are a few things you can do to get outdoors, enjoy the garden and keep up your landscape. Here are some ideas to help keep your gardening juices from freezing along with the temperatures. While your annual and perennial garden beds may be taking the winter off, evergreen trees and shrubs are still looking great and providing a beautiful green backdrop to the holidays. Create wreaths and garland from your own trees, boxwoods and holly bushes or stop in to White Oak to get your materials and attend a Make & Take workshop. There’s nothing quite like the smell and sight of fresh greenery in and around the home to set the stage for this special time of year. 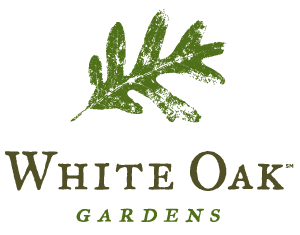 Pick up handcrafted holiday containers and wreaths at White Oak to make your homes’ entrance extra festive. Cover bare soil in your vegetable and garden beds. Use straw, pine needles, mulch, chopped leaves, or some other organic material to help insulate for the colder weather. Also, as the snow begins to fall, be careful as you shovel or remove the snow that is close to your garden beds. Shovels and heavy, heaping snow can do damage even while most of your plants are dormant. Try to avoid roadside snow to collect onto planting areas; it’s most likely full of road salt which can be quite damaging to your plants and soil. Since it’s too cold to really use your lawn and garden equipment, now’s a great time to give everything a tune-up and get it ready to go for spring. For non-mechanical equipment like shovels and rakes, a good cleaning and quick once-over is all you need. Come March or April, you’ll be glad you did it and everything will be primed and ready as the excitement of Spring begins to bloom. It’s not too late to apply Scott’s Step 4 to your yard as the colder temperatures move in. Your lawn will get a head start come Spring as a result. Use caution when spreading salt or ice melt during winter. Remember that the same chemicals in these helpful winter products can be detrimental to plant growth come spring. Try to contain salt to only areas that need it like driveways and sidewalks.